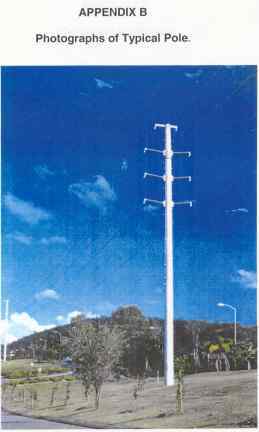 Energex, Queensland power corporation, had decided before any real public "consultation" to install a new dual 33/110 kv power line near residential housing to Brisbane's port at Fisherman Islands supported on 30 and 20 metre high poles. 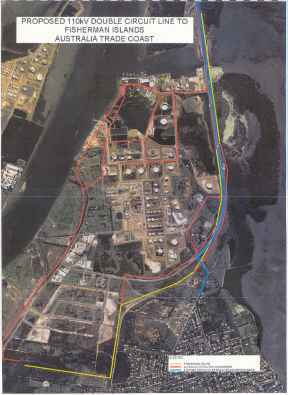 The first the public community was made aware of this development was when Energex representatives informed the community representatives at the Port of Brisbane Corporation (POBC) community consultation meeting held quarterly at Fisherman Island on 11 February 2004. The Port of Brisbane, we were informed, has their power underground and receives discounted power. Energex informed residents, at a meeting I attended, that Energex were paying for the new power line installation. When questioned what is the situation with rural property owners wanting power connected we were told that the land holder is responsible for the costs. Why is one Queensland Government Corporation, Energex, who has a funding structure bases on residential and commercial sale of power, discounting power to another government corporation whose income is based on shipping/loading and unloading freight? Why are residents being asked to pay more for their power to subsidise the Port of Brisbane Corporation new power line? 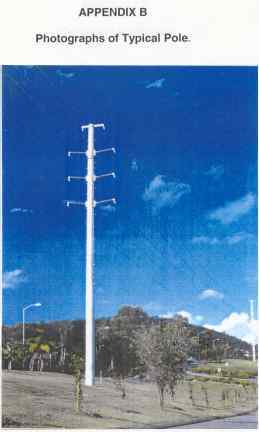 Just how many years will it take to recoup the cost of this power line from the sale of power to the Port of Brisbane power users especially when their power is already discounted. Why does the Port of Brisbane Corporation require their power on Fisherman Islands to be underground and not pay for their new power feeder to be underground especially near residential homes? Special circumstances exist in this case. The residential precinct is close to other industrial plants such as a Caltex oil refinery. The National Pollution Inventory shows that 260 tonnes of particulate are emitted from Caltex each year. Presently Caltex are about to undertake modifications to their equipment so that they can reduce the amount of sulphur in their diesel fuel and the amount od benzene in their petrol and in doing so have informed the community via their Environmental Impact Statement that their air borne emissions will increase. 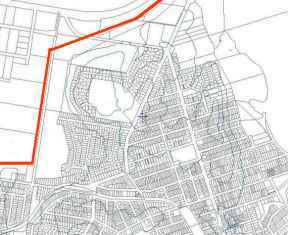 400 tonnes of particulates emissions within the Wynnum post code of 4178 per year. Scientific study exist which prove that fine particles are trapped in high voltage power line's EMF field. This field charges these fine particles which subsequent to wind speed and direction are then blown into nearby homes. These fine charged particles are shown to be a health hazard to humans especially young children.